Fresh veggies, herbs, seasonings and Parmesan cheese blend to create an authentic Italian minestrone with fantastic flavor. No matter what time of year it is, there is something comforting about homemade soup! 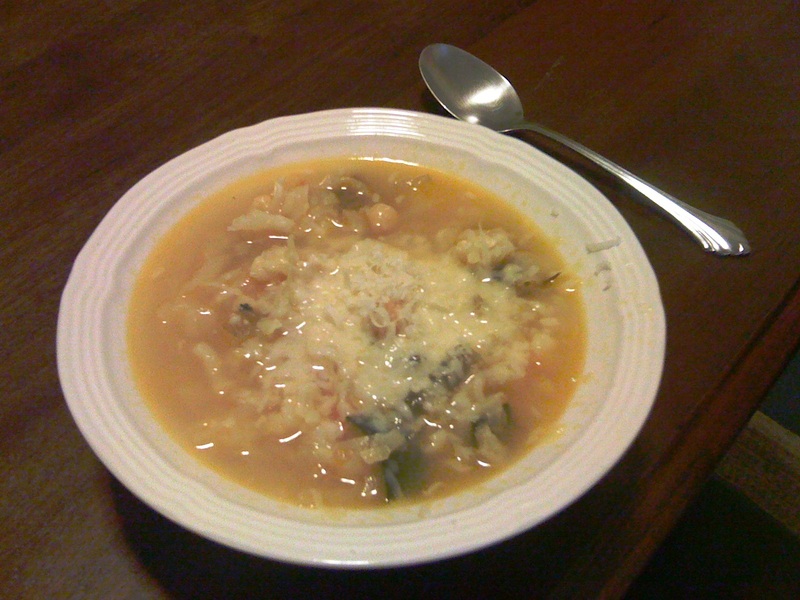 If you are craving a hearty vegetable soup, look no further than this authentic Italian minestrone. Unlike the heavy tomato version you get when you pop open a can of store-bought soup, this has a clear meatless broth base that gets its delicious full-bodied flavor from a bounty of fresh veggies, herbs, seasonings and our secret ingredient, Parmesan cheese! Serve this minestrone up for lunch or dinner, accompanied by a market salad, grilled cheese sandwich or a warm slice of Italian bread. Place 2 tablespoons of the olive oil, the onion and garlic in a large heavy-bottomed soup pot over medium heat. Cook slowly, stirring occasionally, until the onion is translucent, about 3 minutes. Add the zucchini and the celery and keep cooking, stirring occasionally, for 2 minutes more. Add another tablespoon of the olive oil and the cauliflower and cook 5 minutes, stirring occasionally, as the vegetables slowly begin to soften. Stir in the green beans, cabbage, and remaining olive oil, and cook, stirring occasionally, for another 2 minutes. Stir in the tomatoes and 2 cups water and simmer until all of the vegetables are softened, 10 minutes or more. Add the salt, pepper and Parmesan cheese rind and stir. Add more water if needed for the desired consistency—it should be very thick. Cover and simmer 30 minutes. Add the chickpeas and basil sprigs and cook until the chickpeas are heated through, about 8 minutes. Serve in bowls with Parmesan cheese grated over top, freshly ground pepper and drizzled with olive oil.